Key West Accident Lawyer | Monroe County Injury Attorneys Gerson & Schwartz, P.A. Contact Key West Accident Lawyers Gerson & Schwartz, P.A. Were you injured in a car accident in the Florida Keys? When another person causes a crash that leaves you hurt or mourning the loss of a loved one, we recommend you call a Key West accident lawyer at Gerson & Schwartz P.A. We have more than four decades of experience handling collisions that occur in Key West. We will thoroughly investigate the crash and gather evidence of the other driver’s fault. We will use this evidence to prove the driver’s liability and your injuries in an insurance claim in the hopes of obtaining you a fair settlement as soon as possible. However, if an insurance claim settlement after a Key West car accident is not possible, then we can guide you through filing a personal injury or wrongful death in the Monroe County courts. We are not afraid to take your case to trial and prove to a judge or jury that the other driver is at fault and liable for your current situation. Whether you pursue compensation through an insurance claim or lawsuit, we are here to guide and protect you. To speak with our bilingual accident attorneys, contact Gerson & Schwartz P.A. online or call (877) 475-2905. Key West is located at the southern-most end of the Florida Keys, which is an archipelago between the Atlantic Ocean and the Gulf of Mexico. The waters surrounding the Keys are the Straits of Florida. Key West is about 5.6 square miles of land and an additional 1.64 square miles of water. In 2016, the estimated population was 26,990. This makes it one of the most populated islands in the Keys. To drive to Key West, visitors and residents have to rely on U.S. Highway 1, better known as the Overseas Highway, which includes Seven Mile Bridge. Unless you come or go by buy or plane, you are going to use the Overseas Highway to get to or leave Key West. 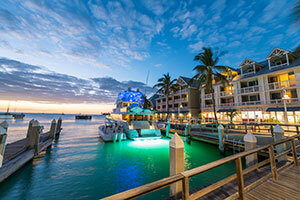 Not only is Key West the southern-most city of the contiguous U.S., but it is one of the most popular Keys to visit. Each year, millions of Americans and foreign tourists travel to the island to take advantage of its culture, nightlife, history, and water activities. This means traffic on the Overseas Highway and throughout the island can become intense. All of the tourists who choose to rent a vehicle for on the island contribute to traffic congestion and increase the risk of crashes. If you are involved in a car crash on the island, whether you live there or are visiting, contact our accident lawyers for Key West as soon as possible. At Gerson & Schwartz P.A., we handle car accident claims on a daily basis. We are highly experienced in handling all types of motor vehicle accidents, including those that involve personal vehicles, commercial trucks, motorcycles, bicycles, mopeds, scooters, and pedestrians. After suffering injuries in a car crash in Key West, which was caused by another driver, contact our accident lawyers in Key West right away. We are here to guide you through the auto insurance claim process. We will investigate the crash, gather evidence, and analyze at-fault and liability. We will take over communications with the at-fault driver’s insurance company so that you do not have to deal with the phone calls and requests for documents. We will provide the insurance company with the documentation and proof it needs to see that the policyholder is responsible for the crash. We will also provide the insurer with proof of your injuries and damages. After a car accident in Key West that causes you harm, you are going to need legal guidance to help you get the most from the insurance claim process. By obtaining legal representation, you improve your chance of receiving a payout. You also improve the likelihood of maximizing your compensation. To learn how we can help after a crash, contact Gerson & Schwartz P.A. at (305) 371-6000 or through our online form.